Looking for an amazing Unicorn drink? 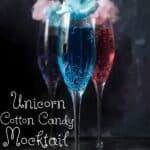 Then you are going to LOVE this Unicorn Cotton Candy Mocktail! This Unicorn drink is so easy to make and the kids (and adults) love it! 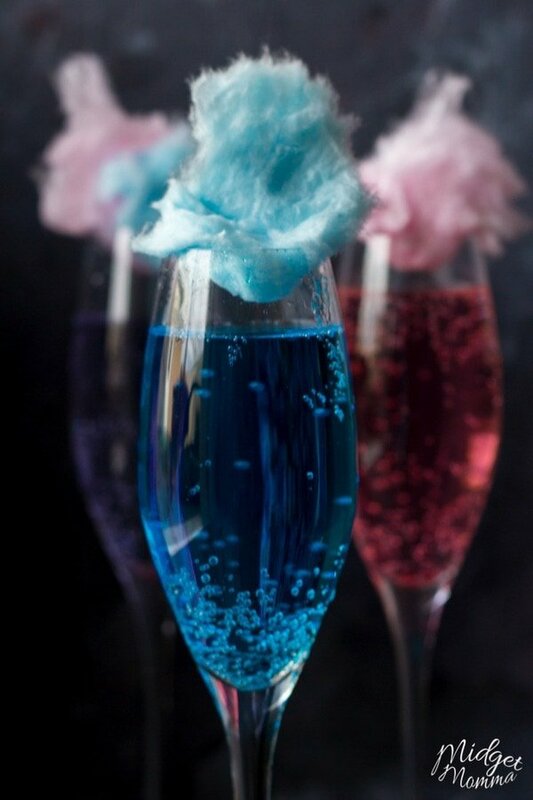 When we are doing something special like New Years or a Birthday my kids always ask me to make the Cotton Candy Drink! If you are looking for super easy mocktails for kids, then this one you totally want to add to your list! It only has to ingredients and making them takes all of like 30 seconds! We call this our Unicorn Cotton Candy Mocktail because it is magical, just like unicorns! Ok maybe we also just really love anything Unicorn related. LOL. 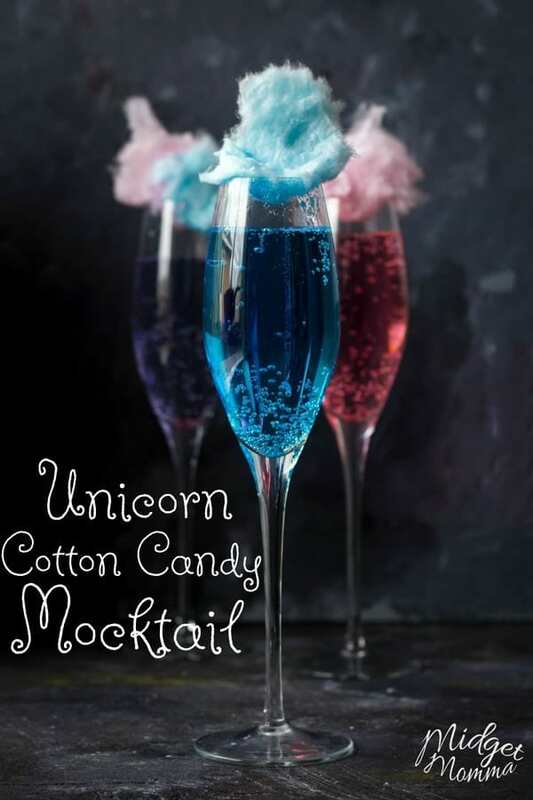 This Unicorn Mocktail is perfect for a Unicorn Party, or any time really. But you could totally make a unicorn fun day making these cotton candy mocktails, unicorn poop cupcakes and making edible unicorn poop slime! I like to get fancy when making this super tasty cotton candy drink and use Plastic Champagne Flutes. The kids seem to love it too! 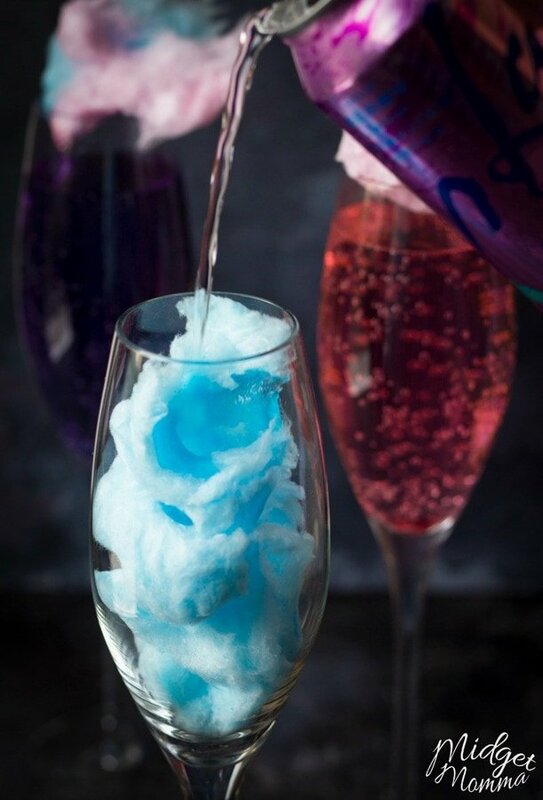 Plus using the Champagne Flutes, is better then a cup because you can put extra cotton candy on the top to decorate, and of course enjoy because cotton candy is amazing! I used la croix berry seltzer when making these, however you can use any clear seltzer that you have, but I think the berry flavor is the best one to go with. You can buy cotton candy premade on amazon, or if you are feeling really fun grab a cotton candy maker and make your own! This Unicorn drink is so easy to make and the kids (and adults) love it! When we are doing something special like New Years or a Birthday my kids always ask me to make the Cotton Candy Drink! Dived the cotton candy into thirds. 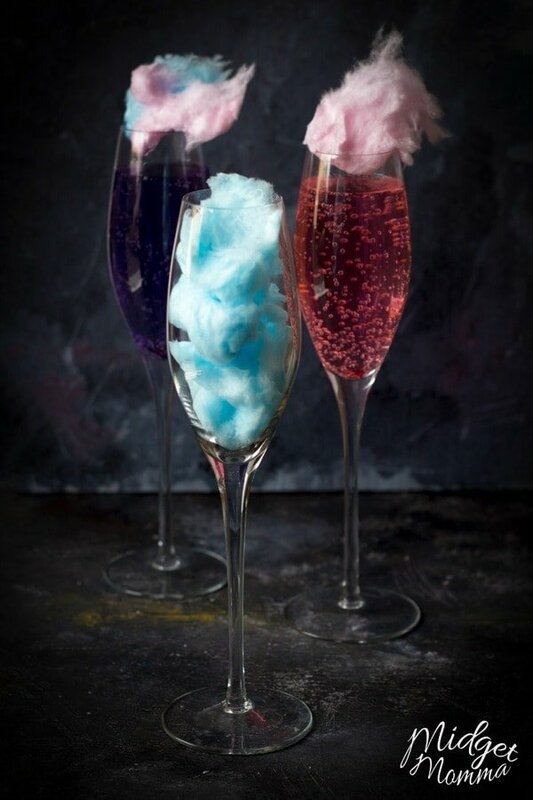 Place each bunch of cotton candy into a champagne glass removing a pinch of cotton candy from each glass and setting aside. 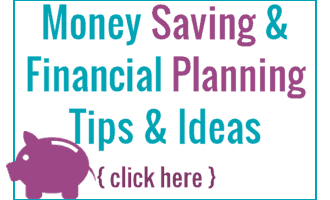 Fill each glass with the seltzer in front of your guest. Top with the reserved cotton candy. When you are making your Unicorn Cotton Candy Mocktail, you can change up the colors. Use pink cotton candy to make a pink drink. 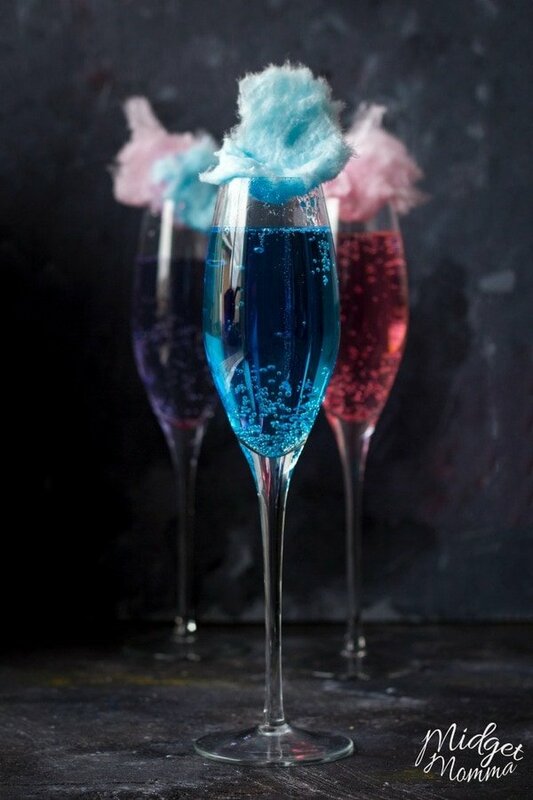 Use blue cotton candy to make a blue drink. 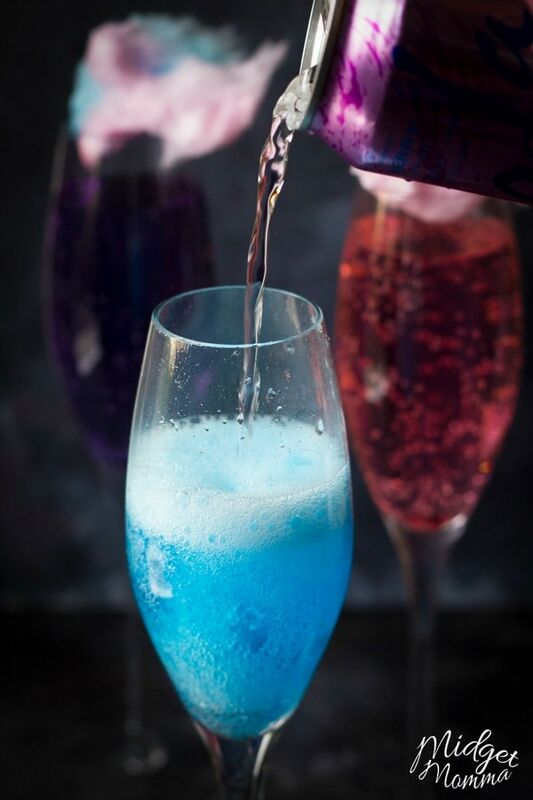 Use 1/2 pink cotton candy and 1/2 blue cotton candy to make a purple drink. Gorgeous looking cocktail! It sounds so delicious too. Can’t wait to try these, Kids will love them.